Home-use microdermabrasion facial, fabulous results at a fraction of the cost! You’ve tried them all; the moisturisers, the exfoliators, cleansing brushes, you name it, you’ve done it. And are you still struggling to achieve the glow that you desire? You needn’t be out of pocket to have brighter, younger looking and feeling skin. Beurer have created the FC100 Pureo Derma Peel Microdermabrasion, which employs microdermabrasion technology to reinvigorate the skin on your face; a professional facial exfoliation device that gives you noticeably firmer looking skin at a cost effective price. Your skin is a magnificent organ; it plays a vital role in protecting the body from viruses, diseases, excessive water loss and well, keeps you looking beautiful. So we should, in fairness, look after our skin just as much as it looks after us. Did you know that your skin sheds an incredible 30,000 dead skin cells in a minute? Ignoring those dead skin cells is what clogs up your pores allowing bacteria to form and create blemishes. Neglecting these dead skin cells can result in skin that looks tired and older because your appearance looks dull and grey. Microdermabrasion is taking beauty and cosmetic treatments by storm and is being used by dermatologists all over the globe; these devices are a breakthrough to the beauty and cosmetic industry, making it more accessible for ordinary people to get hold of and to achieve healthier, younger looking and feeling skin. Want that celebrity shine and radiant youthful glow - now every women can shine! 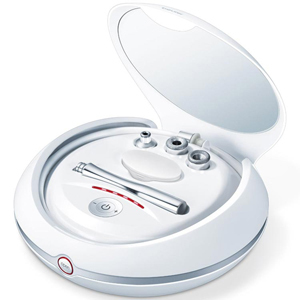 Thanks to Beurer for opening the heavens and creating the FC100, they have made it even easier for you to get the dewy glowing skin in the comfort of your own home. So what is microdermabrasion technology? Microdermabrasion technology is a treatment that gently exfoliates the skin and removes the skin that is lost by a vacuum massage. This procedure makes your skin smoother and the circulation in your face is boosted to give you a healthy glow. The Beurer FC100 Pureo Derma Peel Microdermabrasion machine is an effective alternative to beauty treatments such as botox and chemical peels. Its technique uses tiny rough crystals that gently buff away and exfoliate the surface layer of your skin, providing you with skin that is plump, smooth and soft. It’s not as daunting as it sounds! The Beurer FC100 is designed to remove old skin incredibly gently and give you that dewy glow you’ve always desired with no pain felt! The way it works is that there are 3 different attachments; with 3 different roles. The microdermabrasion home kit has the precision attachment with a fine sapphire coating; this attachment is to treat precise areas such as the nose area. A larger attachment with the same sapphire coating which is suitable for an all-rounder treatment and it can be used on sensitive skin and finally a coarse attachment, with a coarse sapphire coating; this is to treat specific problem areas intensively. Spare sapphire tips and filters are available. Your skin is made up of two layers, the epidermis and dermis; the first layer of skin that is on the epidermis is the stratum corneum. This is the layer of skin that acts as a barrier between the outside and protects the lower skin layer. When the skin is injured or has broken, the body rushes to replace the skin cells that are lost with new, healthy ones. This then provides skin that is improved, soft and smooth. So the way the FC100 microdermabrasion home kit works is that the hand held device and the attachment of your choice will gently buff away the stratum corneum; tricking the body to think that your skin has had an injury and rushes to replace the lost skin cells with healthy new cells. Giving you skin that is new and healthy. Why anti ageing creams haven't worked for you; microdermabrasion could change all that! Have you ever wondered why using anti-ageing creams don’t always work? It’s because creams and lotions that are applied to the skin are actually applied to the stratum corneum; the cells are constantly shedding from the stratum corneum which prevents medicinal lotions and creams from reaching deep into the skin. Removing the stratum corneum allows these products to be more effective because the active ingredients can then find their way to the lower layers of skin. Regular microdermabrasion treatments can help prevent skin from ageing rapidly, reduce fine lines and even scars, as well as eliminating blemishes. The Beurer FC100 promotes a healthier blood circulation to give you the glow you desire. So what are you waiting for? Be a sight for sore eyes and show off your beautiful looking skin, it is there and you too can shine and glow - just like a celebrity!